*’five hundred suns’ from fit is featured on the bonus CD in Issue 4 of extempore! Alister Spence is an outstanding pianist and composer in contemporary jazz in Australia. His playing is featured on more than 30 CDs, several of which have won ARIA Awards. Spence has played with many of the finest musicians in Australia including Bernie McGann, Sandy Evans, Don Burrows, Dale Barlow, Tony Buck and Phil Slater. In addition to writing and performing with The Alister Spence Trio, Spence lectures in Jazz Performance and Arranging at UNSW University. Spence’s talents as a writer have been well recognised with several compositions featuring on Bernie McGann’s 2001 ARIA-winning CD Bundeena. Spence has also composed music for film, often collaborating with film director Ivan Sen. The soundtrack to Sen’s first feature film Beneath Clouds was nominated for the Best Score at the Australian Film Industry Awards 2002. Bassist Lloyd Swanton needs no introduction. Perhaps best known for his work with experimental jazz trio The Necks, Swanton is also the leader, composer and bassist of seven-piece jazz ensemble The catholics. He has performed with many of the cornerstones of modern Australian music including The Bernie McGann Trio, Vince Jones, Stephen Cummings and Wendy Matthews. He is a three-time winner of Best Bassist in the Australian Jazz and Blues Awards. Drummer Toby Hall is highly regarded in contemporary Australian jazz. He has been a member of The catholics and Peter Dasent’s The Umbrellas among others, and has performed with many of Australia’s finest jazz musicians including Bernie McGann, Andrew Robson, Paul Grabowsky, Mike Nock and Don Burrows. For over a decade Toby has been a member of trombonist James Greening’s outfit The World According to James, whose latest album Lingua Franca won Best Independent Jazz Album at the 2009 Jagermeister AIR Awards. The Alister Spence Trio’s fit explores the concept of ‘fitting’, or blending, textures, free improvisation, soundscapes and editing together to form an album that is both an artistic statement and an exploration of the possibilities of a highly attuned and experienced jazz trio. While The Alister Spence Trio incorporates similar instrumentation as The Necks, fit represents such a diverse sound palette that similarities quickly make way to striking differences. Swanton, known for his contribution of mesmerising repeating bass pedals to The Necks’ music, plays a different role in this setting. The pieces are much shorter for a start (fit has a total of 17 tracks, the longest being 7’:29”) and Spence’s different tonal personality behind the piano encourages a different approach more suited to the abstract compositions. The album conjures an abstract tableau of images in the listener’s mind. The use of space, and the gentle decay of Spence’s piano chords expanding that space, creates an unusual, meditative world. It makes for compelling listening; less of a distinct set of instruments vying for solos and working over a traditional jazz head-solo-head arrangement and more of three musicians working as one to create abstract textures and unique tonal arrangements. The second track ‘interior system’ is a good example of this, with Hall using his drums to create a percussive noise effect as opposed to a defined rhythm. ‘five hundred suns’ features a beautiful repeating piano figure, underpinned by Swanton’s moving melodic bass figure. Hall’s drums gradually build, introducing the possibilities of multiple rhythms before choosing one which the band locks onto, propelling the song forwards. It’s a beautiful example of a band in tune with each other—responding to each other to culminate in something that is a sum of its individual parts. I call this song out here as it represents the other side on offer on this album – a melodic composition, perfectly placed between the more abstract textural pieces interspersed throughout the album. It is this juxtaposition that makes the album so diverse and reveals the depth of talent Spence and company have at their disposal. ‘five hundred suns’ is a standout track. This concept of visual arrays created by musical interplay is further emphasised by the inclusion of three tonal projections on the DVD that accompanies the album. Film artist Louise Curham is renowned in experimental film circles for her work using hand-worked Super 8 film, seeking to reinvent the home movie medium through colour, texture and abstracted image. She has contributed work to three songs from the album—‘caught in light’, ‘hover’ and ‘calcium’. With its rumbling, intermittent percussion, grating metallic sounds interspersed with repeating solitary bass notes broken only by a shrill bell-like key, ‘calcium’ is a haunting, brooding piece. Curham’s black and white images of old shop frontages, chain-linked fences and earthen grasses with splashes of colour and erratic typewriter fonts are reminiscent of New Zealand experimental film artist Len Lye, and are perfectly suited to the trio’s textural sound explorations. 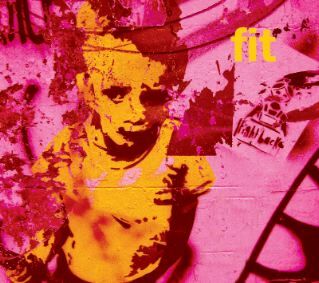 fit is at times eminently listenable and moving (‘five hundred suns’,‘another october’) and at others, confronting and dark (‘calcium’, ‘two halves of the moon’, ‘fathom’). Overall, the edgy balance leans more towards the experimental textural aspects that are the focus of the album. From time to time, these musical abstractions are leavened by Spence’s more formed compositions underpinned by solid interplay and melody. fit can be a challenging listen; it takes the listener on an unusual but richly rewarding spatial journey.